Bloom color is Apricot/orange/pink with a dark red eye at the center. 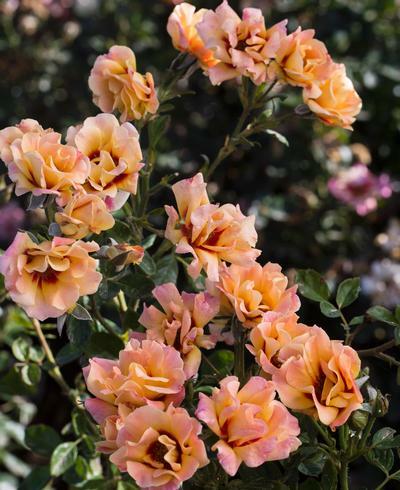 Although listed as a floribunda this is one of the hybrid hulthemia varieties. Excellent resistance to mildew and rust. Newly planted bare root roses need gallons of water! A drip system does not deliver enough water to the roots for growth. We recommend 5 gallons of water per bush until the plant develops many leaves. Finger test the soil at a depth of 3-5 inches to determine if the ground has dried out after leaves have started to appear. Mulching around the rose root zone helps hold in moisture and keeps the area cooler.